Excalibur Billed As The World's Tallest Climbing Wall | OhGizmo! 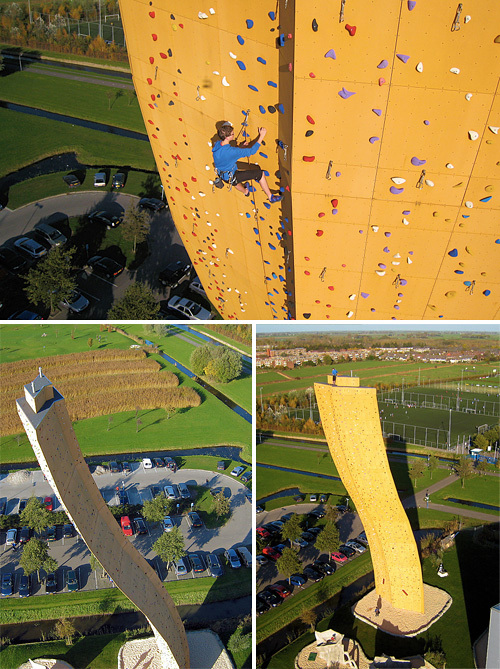 Towering over 121 feet in the air (37 meters) and with an overhang of 36 feet (11 meters) the Excalibur at the Klimcentrum Bjoeks (Bjoeks Climb Center) in the town of Groningen, The Netherlands, is considered to be the tallest climbing wall in the world. As long as you don’t take into consideration mountains, cliffs or other man-made structures not specifically designed for climbing. The curved design results in sections that are easy for beginners to tackle, as well as some extremely difficult parts where experienced climbers will literally find themselves hanging. And the photos of the Excalibur I’ve included were all taken by Flickr user Eric Kieboom who actually used a Canon IXUS 850IS suspended from a kite to grab these most impressive aerial images of the wall. Still not nearly as fun as climbing a 40 foot rock face. Great site.That's almost cooler than the wall.Thanks. I think I've been to Groningen. Too bad I didn't know about this. it's nice to see from the top . Oh my God! This is just so impossible! But it really needs lots of courage! Great job! Congratulations! Congrats! You did it safely! It's very interesting and useful for me. psp, ps3, xbox360, wii, hacks, sony, nitepr, gaming, homebrew, emulators, gameboots, themes, mods, modifications, tutorials, Walk throughs, news, pc, dsi. Impressive! Thanks it’s very interesting!